In his book Mechanisms, Matthew Kirschenbaum pushes against some of the popular conceptions about the nature of new media, mainly, that digital media are immaterial, disembodied, and ephemeral. I think that Kirschenbaum’s project is largely an attempt at demystification; part of the book explores the ways in which computers are not as perfect as they may appear. Kirschenbaum’s approach often reminded me of Lev Manovich’s The Language of New Media, which questions the idea that digital texts are uniquely interactive and democratic. Both Manovich and Kirschenbaum’s focus on disrupting conventional approachs to new media avoid the pro/anti technology stance that some of the other writers I have read so far this semester have fallen into. In Mechanisms Kirschenbaum argues that computers are not free from human error, nor are they free from the imperfections and inconsistencies that characterize all material objects. For Kirschenbaum, computers are subject to forensic materiality: “no two objects in nature are ever exactly alike, and no two objects ever break or wear down in the same way.” We typically notice the ways that our print possessions exist as unique objects. Even though The Joy of Cooking that sits on top of my fridge is one of many “copies,” to me it is singular because it bears the traces of unique acts of inscription: a hand written note from my mother, some reminders to myself about substituting ingredients, a bit of sauce splatter on page 5. Our software and hardware however, are simply too far removed for us to notice these differences. It strikes me that this removal occurs in several different ways, on the one hand it is an issue of scale, without equipment we cannot see the microscopic bits that form our digital world. On the other hand, the removal is the result of several layers of remediated transcription; there is not one single language or act of translation that stands between computers and us. Finally, since computers are commodities and we are consumers, we are largely separated from the people and processes that create our devices. The fact that technology is in these ways removed from us perhaps results in the mystic status that technology enjoys. Maybe this is why within popular culture technology so offers inspires either a purely utopic or dystopic stance. I was watching the new Apple product launches over break while reading Kirschenbaum, and I couldn’t help but make the following comparison. It may sound like a contradiction, but it seems like as technology gets smaller and becomes more integrated into our lives, to some extent, our removal from it only increases. 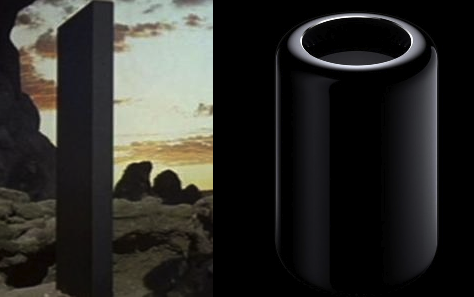 The design for the new mac pro seems to embody the mystification and removal that Kirschenbaum discusses. It is also a little black box. Even though Kirschenbaum’s book is not as overtly political as some of the other works I have read recently, I think that his book has radically political implications. Similarly, even though Kirschenbaum does not directly say that humanists have a responsibility to learn to code, I think that his book presents an incredibly strong argument for that view. If, as Kirschenbaum writes, “all media are bound to the immaterialities of their particular forms” then shouldn’t humanists be concerned with those forms? One of Kirschenbaum’s strongest points is that there is no normative or authentic version of technology; there is no original copy. Because we forgot that technology is material, that it is “made,” we forget that we have control over it. We forget that many things inform our technology, including the market, scientific advances, and physical limits. The material nature of technology forms its boundaries and directly shapes the way that we interact with new media. I’m left wondering though exactly what level of understanding Kirschenbaum espouses. He indicates that even computer languages are still far removed from what is actually going on in our machines. Exactly how close to we have to look, and how much do we need to understand, in order to successful bridge some of the distance between our mechanisms and ourselves? I also reflected on the distance between our knowledge of technological mechanisms and our use of them while reading this book. I think one central question, connected to the questions you asked, is: are we ‘active’ users? Is technology a new form of ‘spectacle’ that separates us from our political power? Can DH contribute, in this sense, as a form of resistance?